This week we’ve we’ve picked out a this snippet of fashion history from the poster collection. 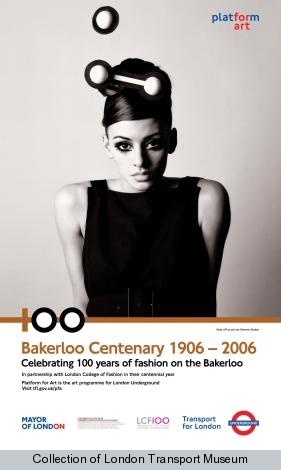 It is one of 10 posters made in 2006 to celebrate 100 years of the Bakerloo line as part of a collaboration between Platform for Art and the Royal College of Fashion. Each poster was inspired by a decade of fashion and de sign on the Underground. This is one of two posters commissioned from Gemma Stokes, who was studying for an MA in Fashion Photography. She’s now a freelance fashion photographer and has had her work in magazines, newspapers and on television. Which one is your favourite and why does it stand out for you?